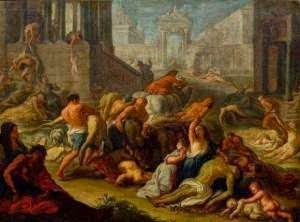 Outstanding among the many representations of the 1720 plague, are the two large scale canvasses by Michel Serre, now in the Musée des Beaux-arts in Marseilles; they the more notable in that Serre was both a painter of the plague and an actor and eyewitness. The pictures are strikingly modern: documentary, snapshots of events with no religious or moral message superimposed. Who was Michel Serre? There isn't a huge amount of information about his life available on the internet. He was born in Tarragona in Spain in 1658 but by 1675, at the age of seventeen, had settled definitively in Marseilles; according to the plague column, though it is otherwise uncorroborated, he was a pupil of the famous Provençal Baroque artist Pierre Puget. In Marseilles, a "second Rome" bristling with religious foundations, Serre made his way rapidly as a religious painter and received many lucrative commissions. In 1685 he married and was able to build a substantial house in what is now the rue Venture. He obtained citizenship in 1690 and received the commission for a Christ on the Cross (now lost) to hang in the Hôtel de Ville. Also, in recognition of his reputation and talents, he was named "royal painter of galleys and drawing master to officers and pilots", painting several portraits of Marseilles naval officers, including one of Louis de Montolieu now in the Musée des Beaux-arts. In 1704 he moved to Paris, where, on 6th December, he was admitted to the Académie royale de peinture as a "history painter". He seems to have maintained an atelier in Paris for a while, since Jean-Baptiste Oudry is mentioned as among his pupils. In 1712, however, he was back in Provence, buying letters of nobility, offices and further properties. What happened next is a little odd. 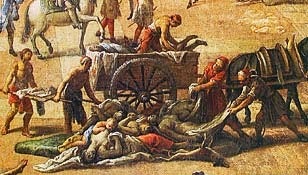 In 1723 the completed paintings were carried off to Paris by Serre's son Jean-Baptiste who exhibited them for profit at the Foire-Saint-Germain (they were advertised in August in the Mercure de France). Modern historians find the episode significant, demonstrating as it does both the documentary worth of the pictures and the growth of a public audience; the pictures were rolled up and transported as a modern cameraman might transport his rolls of film. It may be surmised that Michel Serre himself was less gratified, especially when the Académie de peinture suspended his membership for contravening its rules on exhibiting for money and Monseigneur de Belsunce was forced to intervene to get him reinstated! Here are the pictures in situ in Marseilles. It is difficult to get much sense of them from small reproductions - the canvas showing the Cours - the central open space and thoroughfare of Marseilles (today the Cours Belsunce) - is four-and-a-half metres wide and minutely detailed. Louis Maget's film Autour de la peste has a nice opening sequence based on the picture, which not only shows some close-ups but highlights the startling contrast between the opulence of smart Marseilles and the horrors of the plague. 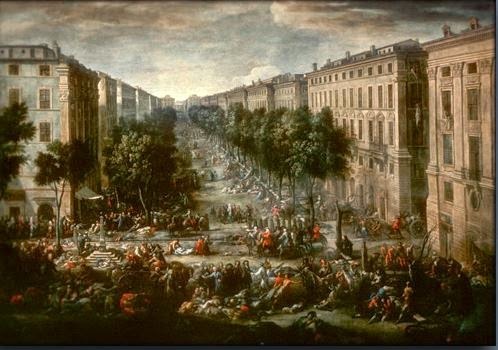 There is only one other painting by Michel Serre which rivals the two Marseilles pictures in scale and ambition, the "Scene of the plague of 1720 at la Tourette" which so memorably depicts the heroism of the Chevalier de Roze. This work belonged to the private collection of Xavier Atger, now in the Musée Atger, Montpellier, but beyond this I have been unable to find any provenance. 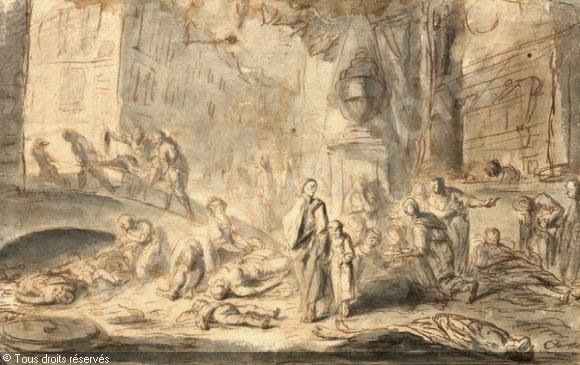 In addition, the Church of Notre-Dame in La Ciotat, along the coast from Marseilles, has a battered canvas, ascribed to Serre,showing three Franciscan friars arriving at Cassis during the plague. 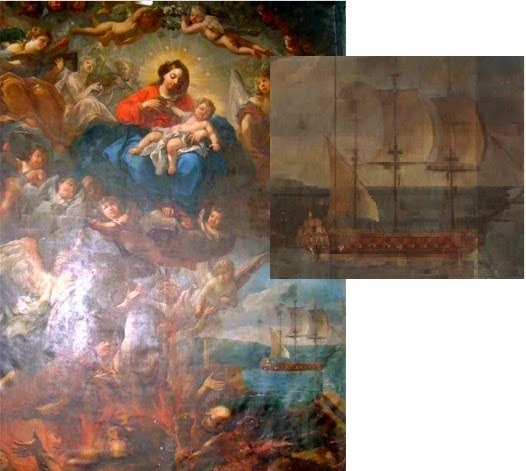 There is also an ex-voto which, although dated 1710, in all probability depicts the plague ship, the Grand-Saint-Antoine. Collection Thierry et Christine de Chirée, 29-20 March 2011.